Joël Moens de Hase is a Belgian mixed media artist born in Brussels 28 November 1959. He lives and works in Brussels. This serial creator has always fully come into his own when embracing the philosophy of action. Before embarking upon his artistic adventures, it was the world of business which for a long time acted as his metaphorical science lab and which saw around fifteen creation of companies spring to life directly from his hands, ranging from the designing of children’s toys to the marketing of products resulting from new technologies. Nowadays, he alternates back and forth almost schizophrenically between two activities that would seem to be polar opposites but which have allowed him to find a balance as one evacuates the stress caused by the second: art frees him from the frenetic life of a businessman but art is also a cathartic response to the questions of a more existential and personal nature. Joël Moens has long been devoted to abstract painting. Yet it was his photo mosaics in 2011 that really caused his artistic career to take off. This digital art, inspired by pixel art and neo-pointillism, reflects the change in status of the image stemming from the technological revolutions at the end of the twentieth century. They rapidly caught the interest of a national and international viewership, and both were highly receptive. Joël Moens de Hase’s photo mosaics invoke a two-dimensional reading. The background is made up of between 5000 and 17000 tiny photographs of delicate feminine curves drawn from a wide range of sources (stockshots, mail order catalogues, e-journals, etc.) Joël Moens spends 2 years to collect 80 000 pics ! In his artworks, they come together in the foreground to form a unified whole, generally representing a portrait or symbol of eroticism. The photo mosaic technique lends two particular characteristics to his work: depth and an array of colours. It can also be viewed in two different ways depending on whether you look for the content or the form. 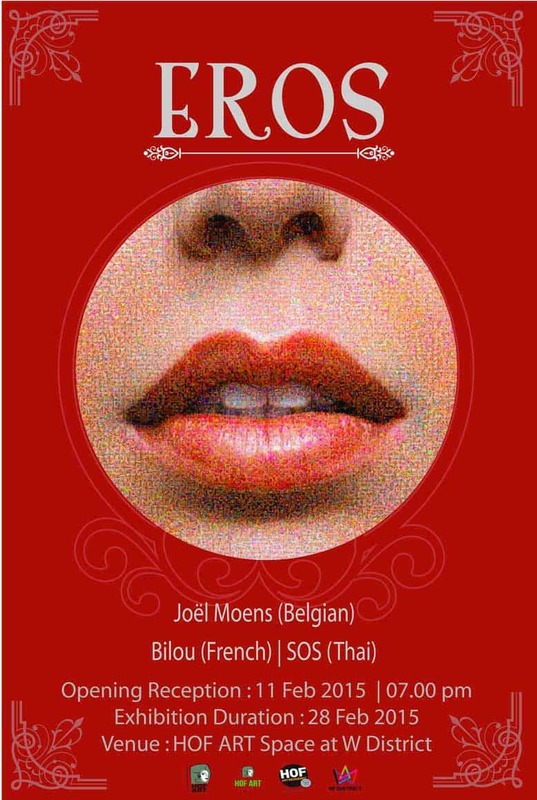 Eros presents Joël Moens (Belgian), Bilou (French) and SOS (Thai) from February 11th 2558, at the HOF ART SPACE 19.00pm . at Hof Art Space W District. Tropikos will be on view from January 24th – February 28th (everyday 10:00 – 19:00), 2015 at HOF ART SPACE @ W District. วันที่ : 11 กุมภาพันธ์ 2558 เวลา 19.00 น.